Jo-Wilfried Tsonga will make his first appearance in Washington since 2009. 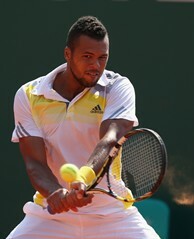 Jo-Wilfried Tsonga, the hard-hitting Frenchman who is currently No. 8 in the world, will return this summer to Washington’s hard-court classic, the Citi Open, after a four-year absence. Tsonga, 28, headlines a men’s field that includes the entire U.S. Davis Cup squad—20th ranked Sam Querrey, No. 21 John Isner and the top-ranked doubles team of Bob and Mike Bryan, who are coming off their record 88th career victory at the Italian Open. Others committed to the 48-player men’s draw include American Mardy Fish, Gael Monfils of France and Australians Bernard Tomic and Lleyton Hewitt, the tournament’s 2004 champion. Rising star Sloane Stephens, 20, who scored the biggest victory of her career in toppling fellow American Serena Williams in the quarterfinals of the Australian Open earlier this year, will return to contest the title in the 32-player women’s field. Currently 17th in the world, Stephens is the top-ranked American behind Williams, 31. She is also the youngest player among the Top 20 in the WTA rankings. Stephens reached the Citi Open’s semifinals last year. The 35-year-old Bryan brothers have won 13 Grand Slam championships, claimed the gold medal in doubles at the 2012 London Olympics and are three-time victors in Washington. The Citi Open, which is celebrating its 45th year, will be held July 27-Aug. 4 at the William H.G. FitzGerald Tennis Stadium in Rock Creek Park. The tournament is one of 11 ATP World Tour 500-level events, a prestigious distinction reflecting the quality of an event’s field and the size of its purse, and is regarded as a key tune-up for the season’s final Grand Slam event, the US Open.